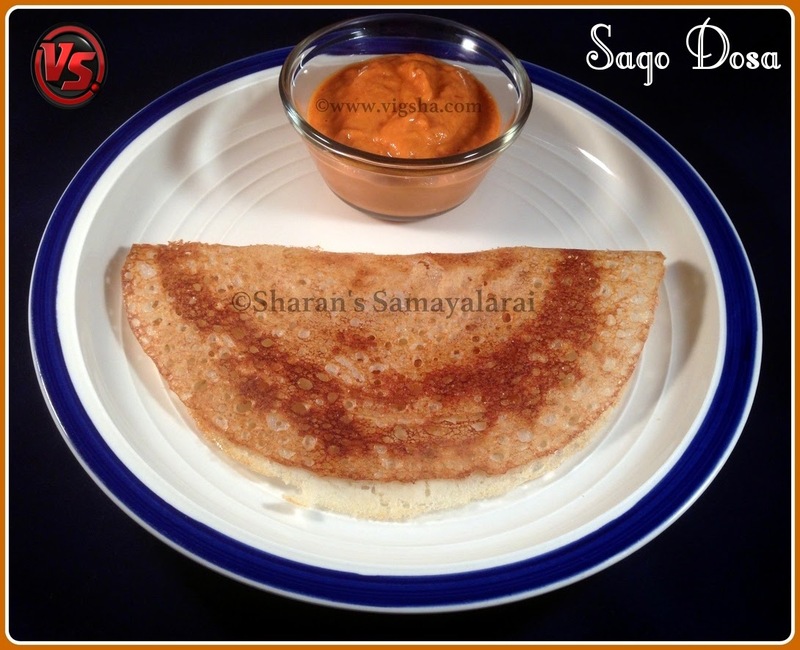 Javvarisi/Sago/Sabudana dosa is a good alternate from the regular dosa. This is an instant dosa recipe which doesn't needs fermenting. This simple dosa can be consumed on fasting days too. Check out my other dosa versions - Mushroom Masala Roast, Cauliflower Dosa, Banana Dosa, Muttai(Egg) Dosa, Tomato Dosa, Crispy Dosa. 1). Soak javarisi (sago) in a bowl and in another bowl, soak the rice along with fenugreek in water for a minimum of 2 hours. 2). After 2 hours, drain the rice along with fenugreek and grind it in the mixer. When it half done, add the saga along green chillies and ginger. Grind everything to a nice smooth batter by adding enough water. Mix salt, yogurt mix together well to combine. 3). Heat a dosa pan and grease it with oil. Pour a ladle full of the batter and spread it to a thin dosa. Pour a teaspoon of oil and cook the dosa until the dosa starts to crispen and brown. Transfer it to a plate and serve hot with spicy chutney. Its best served when it is hot. I served it with Tomato Sambar. # Dont skip the curd. If you are not using curd you have to ferment the batter. # You can also include coriander or methi leaves or veggies or chopped onions and make it healthier. # The batter should be free flowing but thick not runny. If the batter consistency is too thick, you can adjust water and add more. It should be slightly looser than dosa batter consistency.